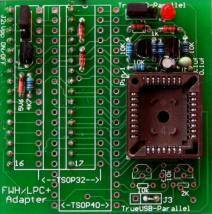 This FWH/LPC+ adapter is backward compatible with Willem programmer's FWH/HUB adapter. It supports both True USB as well as parallal willem programmer. It's able to accept TSOP32 and TSOP40 ZIF socket for supporting TSOP32 and TSOP40 FWH/LPC flash chips. This adapter is for True USB/Standard/Enhanced Willem EPROM programmer.